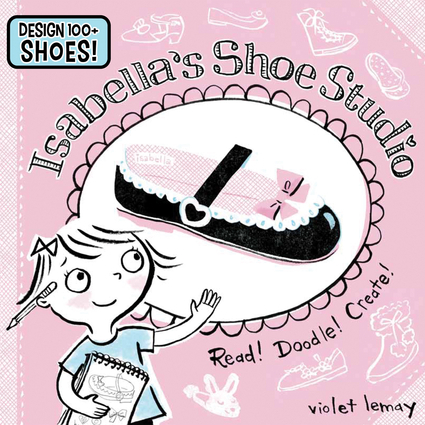 Isabella is a smart and funny seven-year-old girl who dreams of becoming a famous shoe designer. She talks all about her artistic family while showing her absolute love for shoes. But that’s not all; Isabella invites young artists not only to read the story, but also to doodle tons of fun stuff and create their own art. With a list of “Cool New Words” and a list of resources for places where readers can donate shoes and help people in need, this book is a perfect fit for girls with artistic dreams and charitable goals. Combining a fun and quirky narrative with creative doodles and activities, this interactive storybook is sure to keep stylish little artists busy for hours. Violet Lemay is an award-winning illustrator whose children's books include Beach Doodles, Doodle Chicago, Doodle New York, Doodle San Francisco, My Foodie ABC, and New York Baby. Her work has appeared in American Baby, Better Homes and Gardens, Elle, Family Circle, the New York Times, Parent and Child, and the Wall Street Journal. She lives in Saratoga Springs, New York.